Mobile devices are inherently local tools and there are now more than 100 million mobile phones in the United States alone. People use their smartphones for all sorts of things that they might also do on a wired computer at home or at work. However, we are seeing data that enforces the intuitive idea that people use their smartphones when they are “out and about”, “on the go” and are interacting with local marketing. Over the last 15 years, this “online/ offline” “bricks and clicks” “web meets world” nirvana for marketers has been more myth than reality. But, good things often take time and this one is coming around. The intersection of local marketing and mobile marketing will be one of the real “sweet spots” in digital marketing over the next 5 years. We often use our smartphones when we need information that is immediate and proximate. 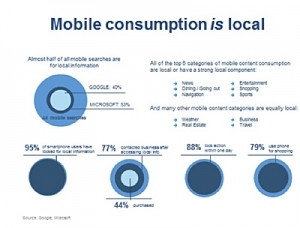 Google says that 40% of mobile searches are for local information. Yahoo says 53%. Content consumption in mobile is different than wired and what stands out is the consumption of local information on mobile devices – top content categories in mobile are news, restaurant/going out sources, weather, maps/navigation, sports and other inherently local content categories. Google calls them “local information seekers” and they are highly valuable consumers to marketers because they are out and about in their local communities and engaged with contextually relevant content and inclined to act on the information they are consuming – in other words, marketers can reach them closer to the buying decision than ever before. If mobile and local have an inherent affinity in consumer usage, ad spend should follow. So it shouldn’t be a surprise that BIA Kelsey recently reported that almost 70% of total mobile ad spend will be local by 2015. Kelsey defines local as geo-targeted ads that may include local copy and/or calls to action (call, map, address of nearest location). So, really, no matter how you slice it, you come out in the same place. While the above data from Kelsey looks at how local as a category will dominate the overall mobile spend, the graph below shows how mobile as a category will dominate the overall local spend. How will retailers spend their digital ad dollars? Based on this, they will spend it on mobile – and at the expense of online. Much of this growth will come from national advertisers who are recognizing that locally targeted campaigns and messaging are particularly effective in mobile since they are catching people’s attention when they are looking for information and connecting with the world around them and often near geographic points of sale. With all the growth in eCommerce, 96% of retail sales still occur in stores in the real world within a 30-minute drive of home. By targeting people on mobile devices with real-world messaging and information, brand advertisers are getting closer to closing the loop. Make sure your digital marketing agency understands this information. If they don’t, give us a call.